Hello all! It’s time for another Holmes-made giveaway! To celebrate hitting (and totally surpassing) 2,500 likes on my Facebook page, I’m giving away one of my fine art giclee prints. Up for grabs is a print of my Moonlit Lovers, which features a wonderful Audrey Hepburn quote (“The best thing to hold on to is each other”), a loving couple in a nighttime countryside scene and a moon-gazing hare – an ancient symbol of fertility. This professionally printed piece is A4 in size and will be supplied unframed and unmounted, leaving you to choose framing options to suit your decor. It’s printed to Fine Art Trade Guild Standards (so the colours will stay true for a loooong time) on beautiful Somerset Enhanced Velvet paper, a scrummy textured paper which oozes quality. The print will also be signed. Entering is simple. For your chance to win, send me an email to holmesmadecomps @ gmail.com (without the spaces) with the title “Moonlit Lovers comp” in the subject line. If you fancy, you can even write me a message if you like, but all I need is the email – that’s it. Couldn’t be simpler!! Emails must be received by 7pm on Friday 1st March, and I will announce the winner that night. The winner will be notified via email with a little nod on Facebook page, since FB rules don’t allow me to state winners on my page! So what are you waiting for? With my order books chocka for the whole of 2013, this is a great way to get your hands on a bit of Holmes-made loveliness for no money at all! You could give it to your Mum for Mother’s Day, gift it to your other half or maybe even keep it for yourself. 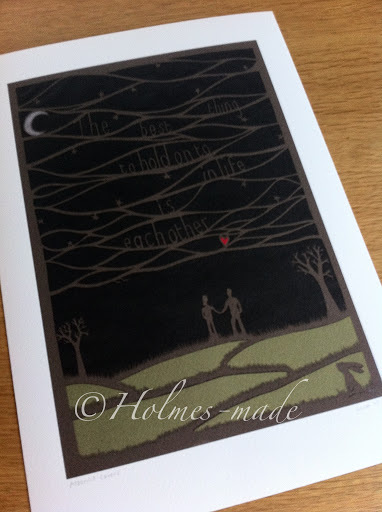 The main prize is an A4, unframed, unmounted fine art giclee print entitled Moonlit Lovers. If you already own this print, an alternative print will be offered from what I have in stock. Entries from the UK only please people – although I’m feeling generous, I’m only going to cover UK postage. 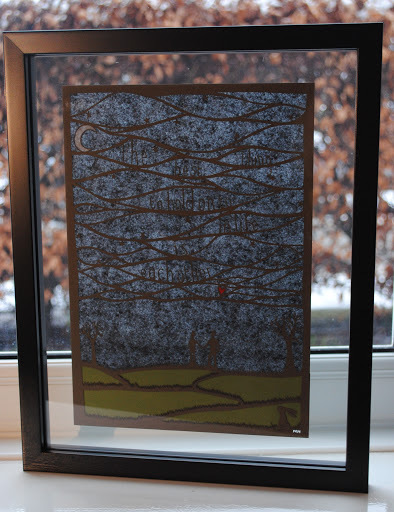 The winner’s print will be posted out to them on Saturday 2nd March 2013, First Class. Competition entries must be sent to holmesmadecomps @ gmail.com (no spaces) and received by 7pm on Friday 1st March 2013. Any entries received after this time will not be included in the draw. I will draw the competition and let the winner know via email and via an announcement on this blog on the same night. I promise I will never pass your details on to any third party, they will just stay stuck in my email account forever – although I might use them to get in touch with you about future offers or products (let me know if you’d like to opt out). The winner will be chosen using a random number generator (each email will be numbered and the winner will be selected that way). This giveaway is in no way endorsed by or associated with Facebook at all, in any way possible. Ever. If you have any questions, please give me a shout – holmesmadecrafts @ gmail.com (without the spaces).